After my crash landing in Nanning, it was time to figure out my next step. 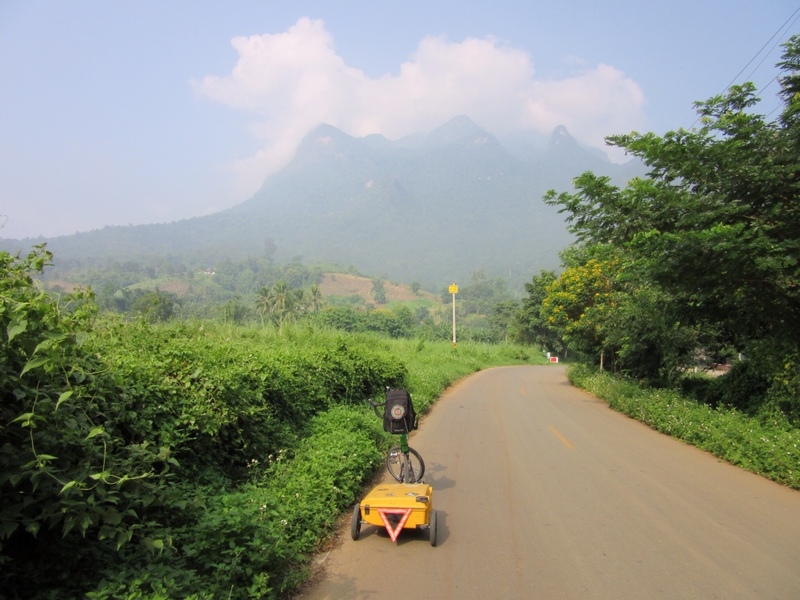 I had a vague plan to continue biking into Vietnam, then across Laos to northern Thailand. But after grinding my way across Guanxi province for a solid week, I realized that would take much more time than I had imagined. 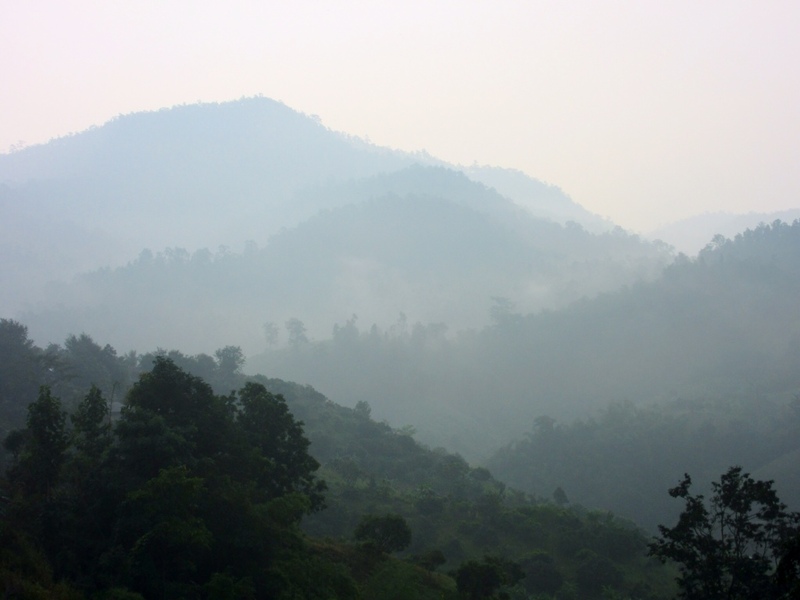 When I found a cheap flight from Nanning to Chiang Mai, I went for it. Three days later I was on a plane, and breathing a sigh of relief. 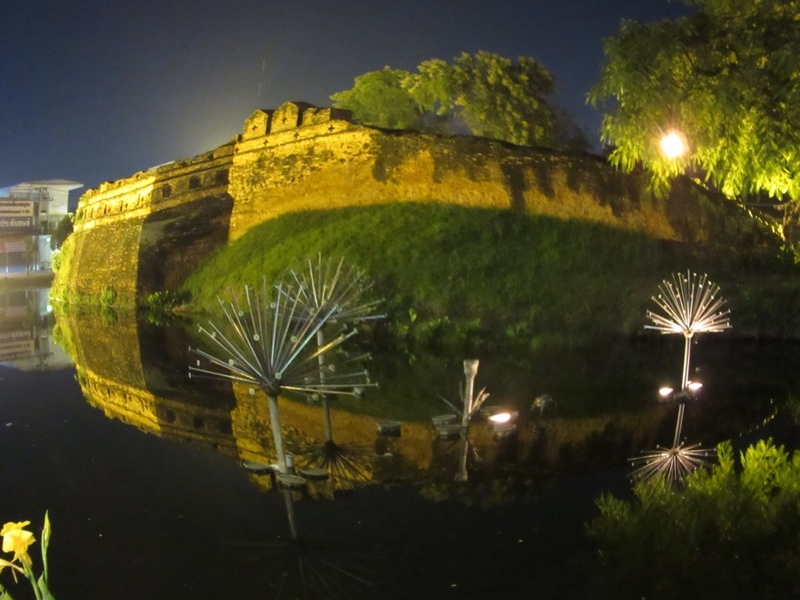 After the chaos of China, Chiang Mai was a slice of backpacker heaven. Smoothies and cappucinos, yoga studios and massage. Beautiful buddhist temples on every corner. And all of it dirt cheap thanks to the ridiculous exchange rate that keeps the tourist dollars flowing. Six lazy days went by in the blink of an eye, and I'd done little but eat, sleep, read and visit temples. 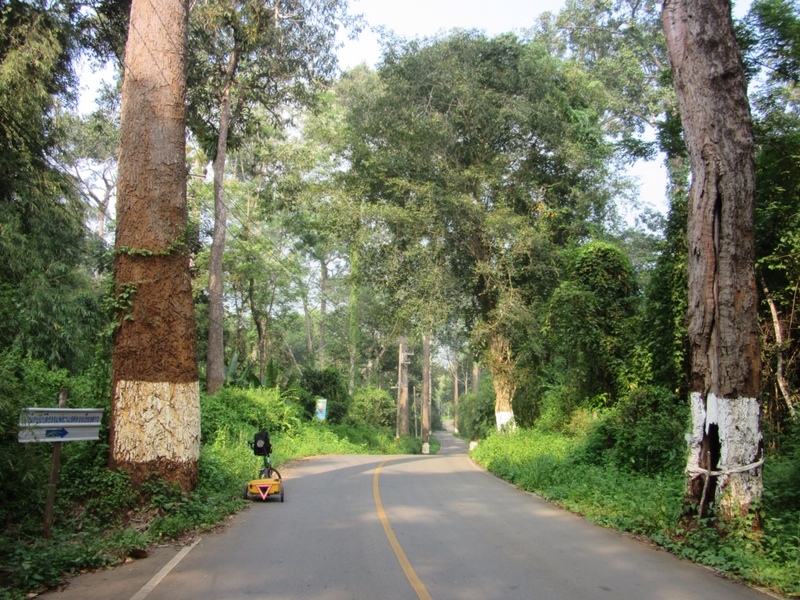 Finally I started to feel guilty about all this indulgence, so I packed up and got back onto my bike, heading north and east toward the Golden Triangle and Laos. My first day out, I was on the bike at 6 am and passed monks out in the morning streets with their begging bowls. I realized with delight that this was a ubiquitous phenomenon all across Thailand. 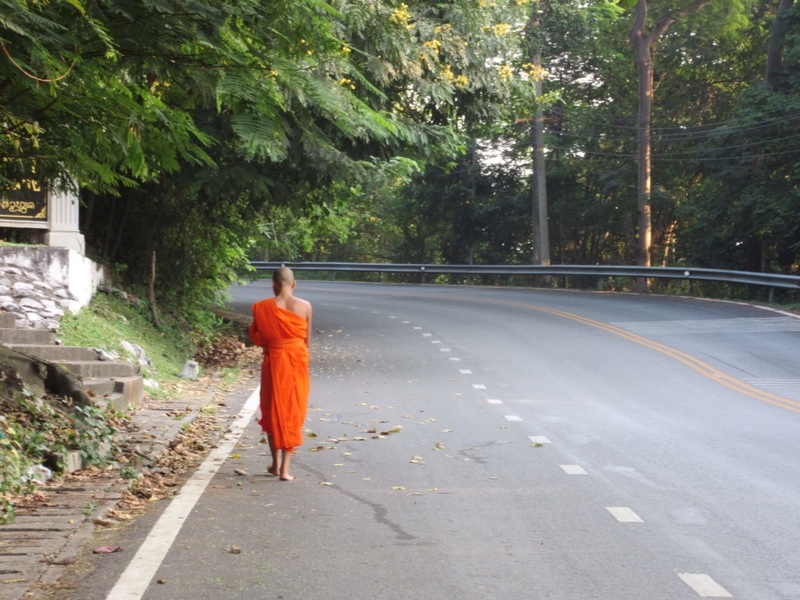 If you are out and about early in the morning, you will encounter monks. If you offer them food, they will accept it and chant a blessing for you. This quickly became part of my morning ritual. What better way to start a bike ride than with a monastic blessing? 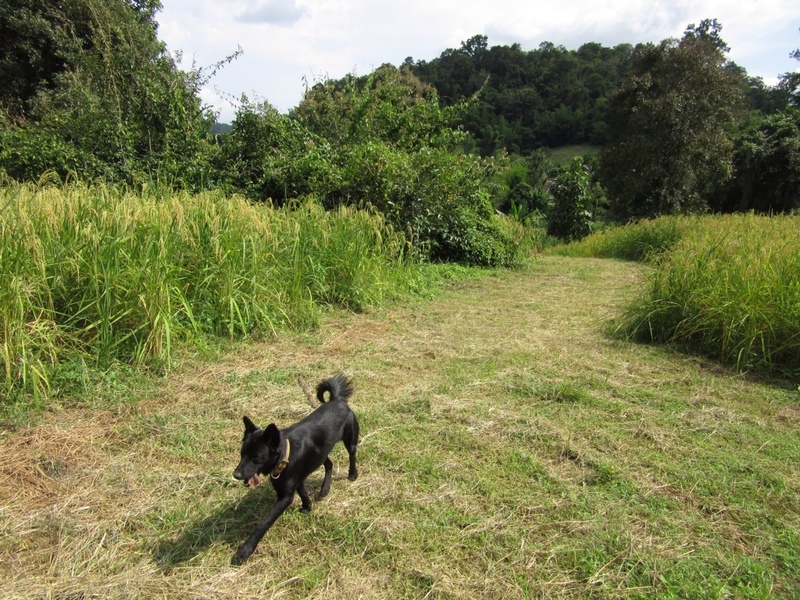 My first night, I stopped at a farm in the hills north of Chiang Mai, where I rented a bamboo bungalow. At the farm I was adopted by a black dog who reminded me of Pixie. The dog toured me all around the farm, and even came to my bungalow during a rainstorm to check on me. Next stop: elephants! 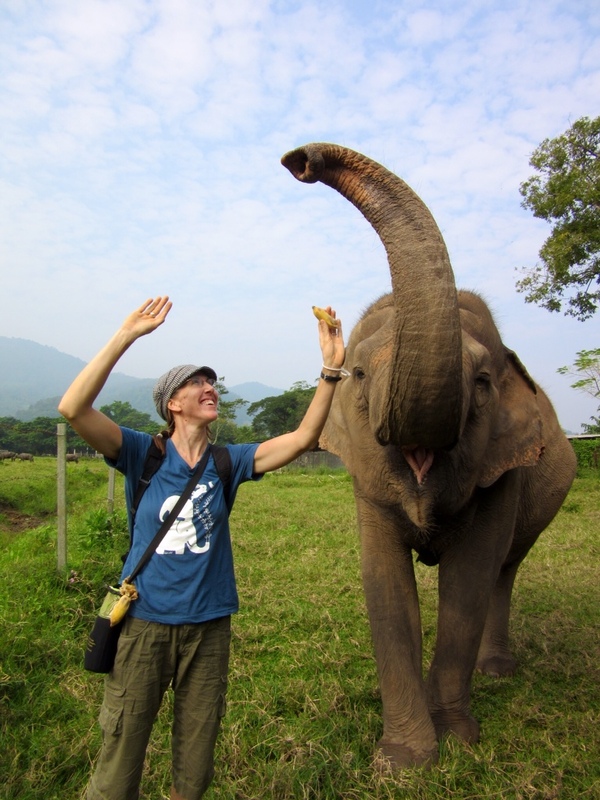 I spent two days visiting a wonderful place called the Elephant Nature Park, which rescues injured and abused elephants and lets them roam freely on their 200-acre preserve. There's no elephant riding, no shows, just quality time with these lovely creatures. 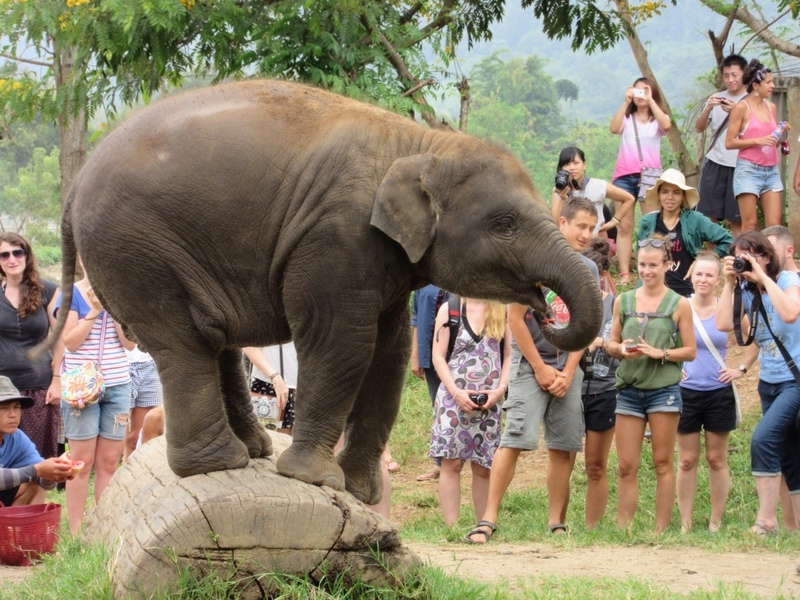 Elephant Nature Park was founded to provide a haven for abused elephants, but also to pioneer a different, more humane type of elephant tourism. 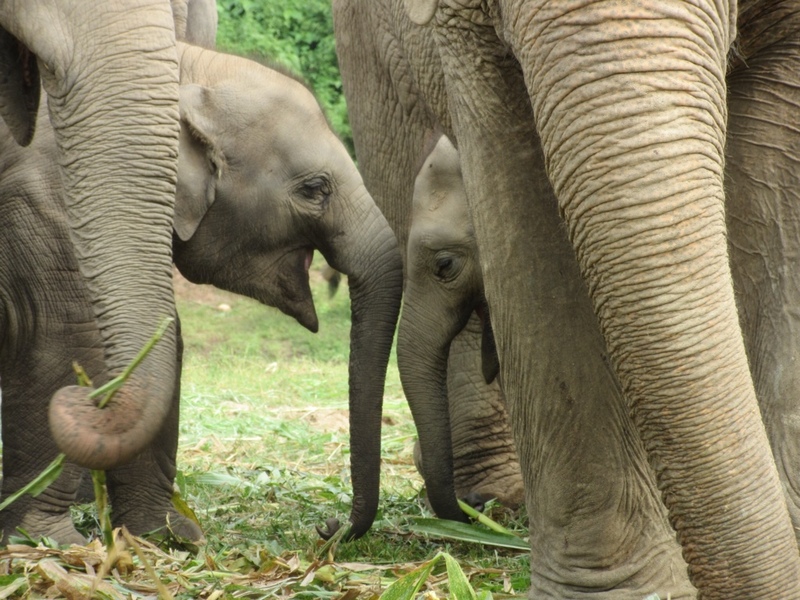 The focus here is on direct, voluntary contact with the elephants as individuals — learning their personalities and stories. 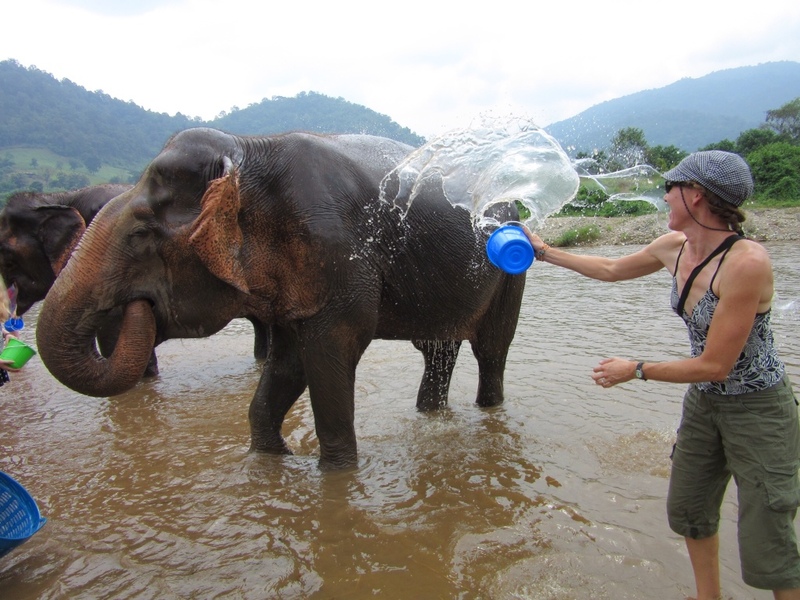 The elephants can choose how much they want to interact with the visitors, who woo them with bananas and watermelons — and buckets of water in the heat of the day. 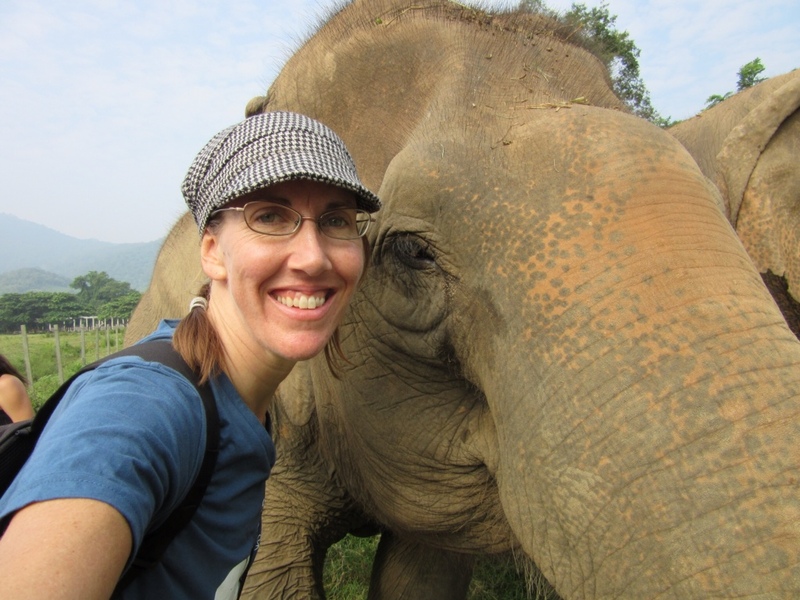 Selfies with elephants – known here as “elphies” – are hard to resist. 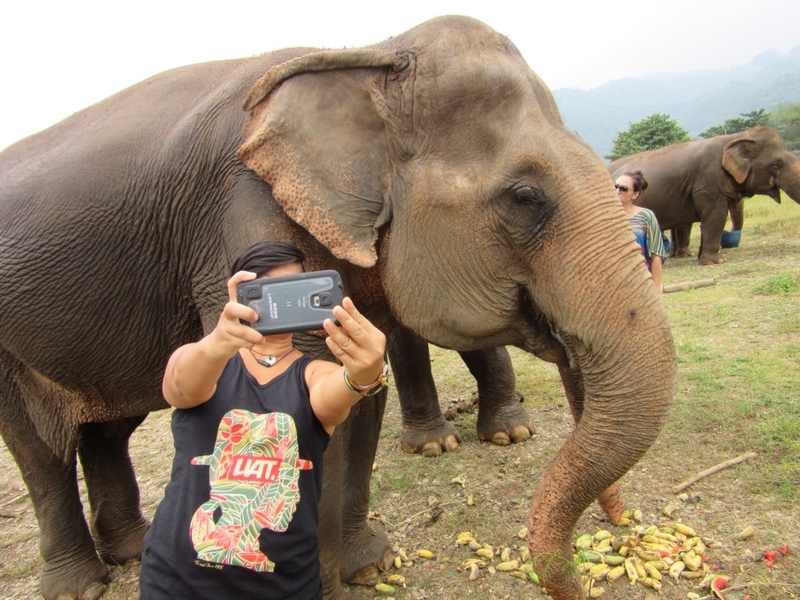 This elephant-friendly tourist model seems to be working; getting overnight reservations wasn't easy and the place was packed both days with day-trippers from Chiang Mai. 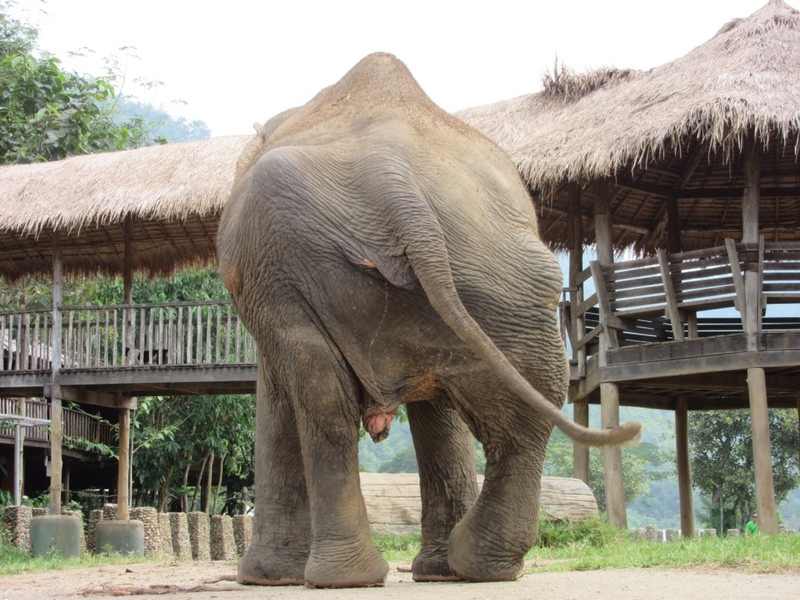 Some of the elephants have survived horrific situations and still bear the scars of their former lives. But there are also some happy stories, such as these two youngsters who were born at the park and have only known the good life. 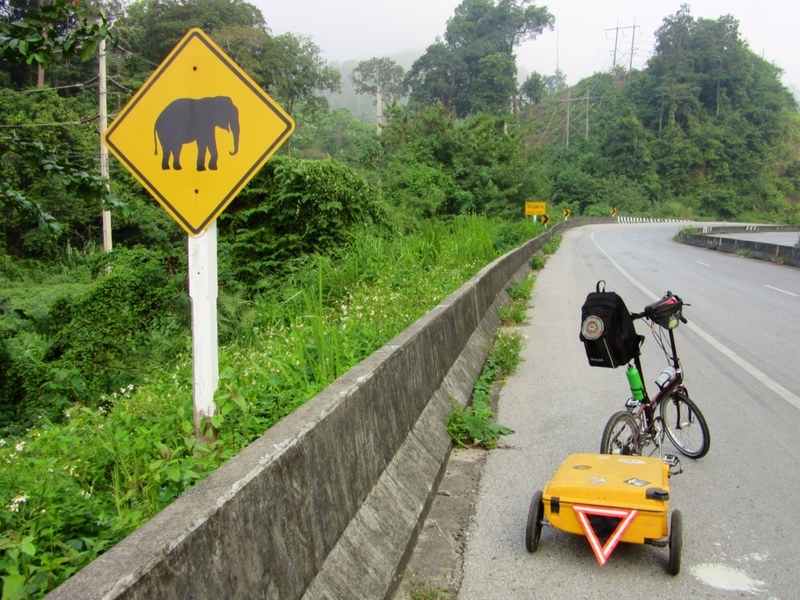 After I left the elephant preserve, I cycled deeper into the mountains of northern Thailand, through forests and fields of rice and corn. I visited temples, cycled over mountain passes, explored caves filled with Buddhist imagery, and rolled through small villages and towns. Most nights, I stayed in musty little hotels where I was the only guest. I wondered what my Thai hosts thought of me as I sat alone in the hotel restaurant, eating green curry and reading Game of Thrones before going to bed at 8 pm. Luckily, I was usually too tired to worry much about it, and Thai people are too polite to ask questions! Here are some photos from along the way. 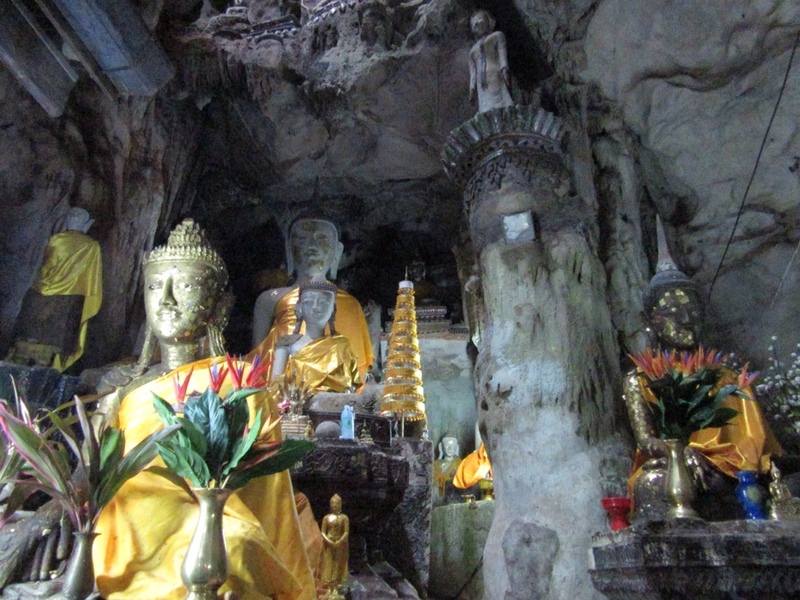 I visited several limestone caves which are considered sacred and contain many buddhist shrines and images. 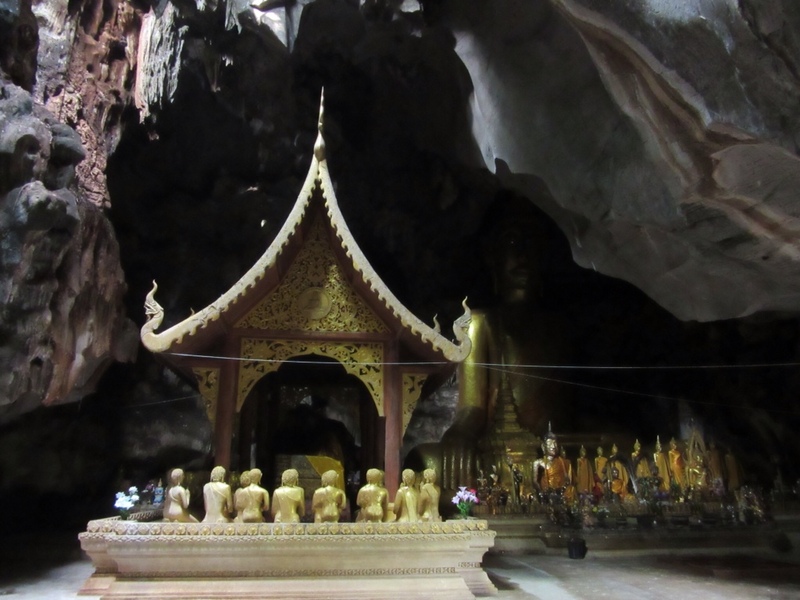 In this photo you can see the hand and arm of a giant buddha at the back of the cave. 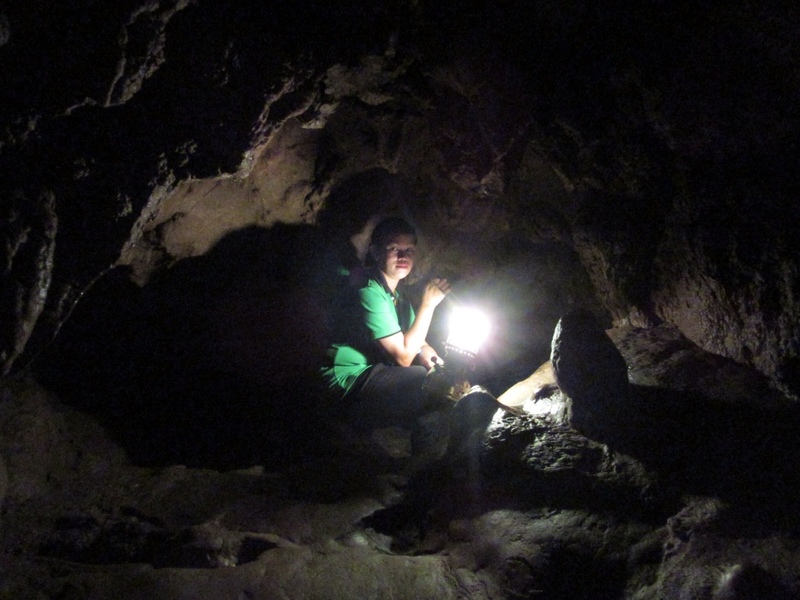 Carved out of solid rock and painted gold, it stood 40 feet tall and has eyes that glitter in the darkness. One long, hot day, it was getting close to lunch time when I stopped at a small village temple for a break. Thai temples are perfect rest stops for bicycling. They welcome all comers, there is always a toilet and sometimes free drinking water. If its a popular temple, there are a few food vendors by the entrance, and you can always find a quiet, shady place to sit, meditate or even nap. On this particular day, I noticed some activity by the entrance to the temple, but it wasn't until I walked through the gate that I saw dozens of monks and hundreds of people milling about. I had stumbled into some big event. A little intimidated, but needing to pee, I started edging my way around toward the back of the crowd. “Hello, are you hungry?” a voice called. I turned around and saw a table full of people looking at me. An older man was smiling and gesturing for me to come over. The table was covered with a huge assortment of potluck dishes, noodles and bamboo shoots and roast duck and barbequed pork. Minutes later, I was seated at the table and many hands were piling food in front of me. I ate until I couldn't eat any more, and then someone gave me an impromptu tour around the temple. When I asked what the festival was about, my guide simply said it was “a Buddha day” but that's all his English would allow. 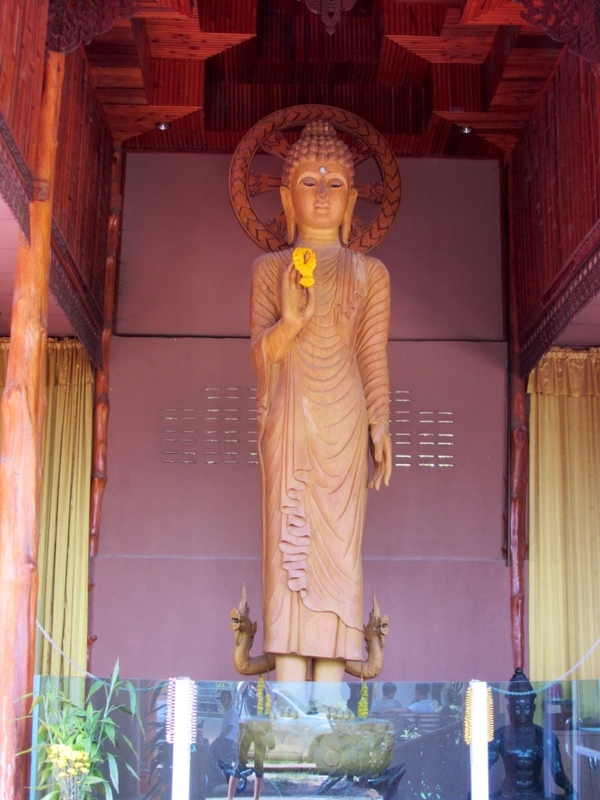 He showed me a tall wooden statue of a standing Buddha, and said that it was came from California and was made of a special red tree that only grows in California. I was flabbergasted. I looked closer and, sure enough, this here's a redwood Buddha. 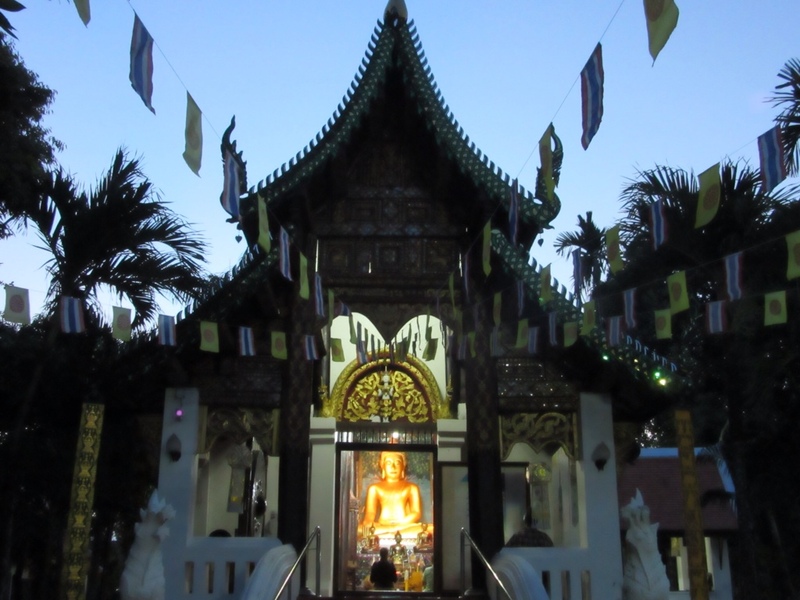 Redwood Buddha in Thai temple - what are the odds? I can't help wondering about the backstory here. But language barriers being what they are, all I could do was enjoy the kindness of the villagers, and appreciate the serendipity of stumbling upon a little bit of home in this most unexpected of places. I ended this leg of the bike tour in Tha Ton, a pretty little village on the Kok River, near the border with Burma. 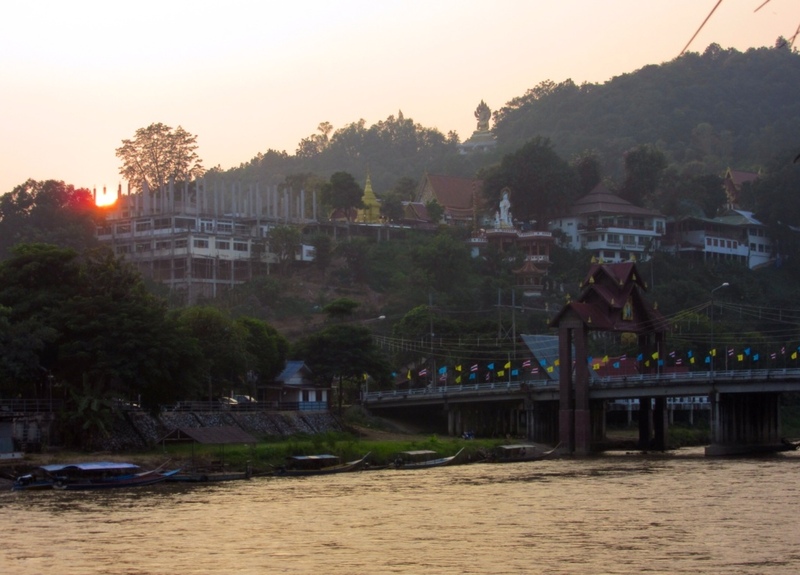 In Tha Ton, I packed up the bike and boarded a longtailed boat, which took us down the river to Chiang Rai. I'm enjoying some rest and preparing for the next leg of the journey: Laos! I am so impressed with your trip, your posts and your biking. You are awesome Autumn!